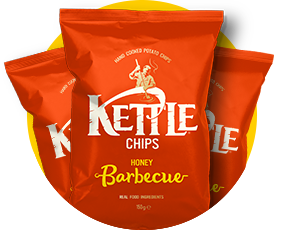 Hints of rich tomato, pepper and onion are drawn together with sweet honey to create a traditional barbecue recipe. Great with a barbecue in summer but delicious all year round. Potatoes, sunflower oil, dried honey, sugar, dried tomato, salt, yeast extract, dried red bell pepper, dried garlic, rice flour, dried onion, ground paprika, dried lemon juice, ground black pepper, dried vinegar, smoked salt, dried chilli, dried cumin, dried oregano.